Dahlia (UK /deɪliə/ or US /dɑːliə/) is a genus of bushy, tuberous, herbaceous perennial plants native to Mexico. A member of the Asteraceae (or Compositae), dicotyledonous plants, related species include the sunflower, daisy, chrysanthemum, and zinnia. There are 42 species of dahlia, with hybrids commonly grown as garden plants. Flower forms are variable, with one head per stem; these can be as small as 5 cm (2 in) diameter or up to 30 cm (1 ft) ("dinner plate"). This great variety results from dahlias being octoploids�that is, they have eight sets of homologous chromosomes, whereas most plants have only two. 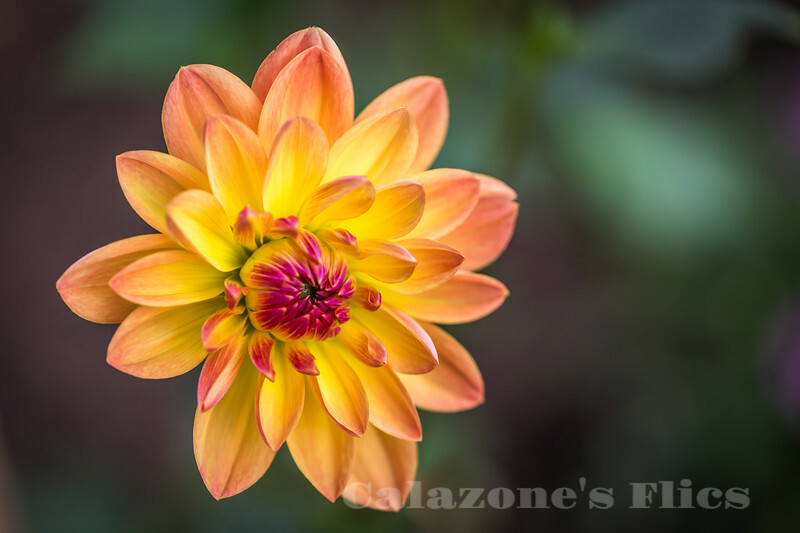 In addition, dahlias also contain many transposons�genetic pieces that move from place to place upon an allele�which contributes to their manifesting such great diversity. The stems are leafy, ranging in height from as low as 30 cm (12 in) to more than 1.8�2.4 m (6�8 ft). The majority of species do not produce scented flowers or cultivars. Like most plants that do not attract pollinating insects through scent, they are brightly colored, displaying most hues, with the exception of blue. The dahlia was declared the national flower of Mexico in 1963. The tubers were grown as a food crop by the Aztecs, but this use largely died out after the Spanish Conquest. Attempts to introduce the tubers as a food crop in Europe were unsuccessful. I'm very partial to shots of dahlias in the process of opening, and of two-tone dahlias. Tick, tick. Love this.